The Government of India is expanding ties with small countries and island nations based on its assessment of various relevant factors. The opening of more Missions in such states is under active consideration. 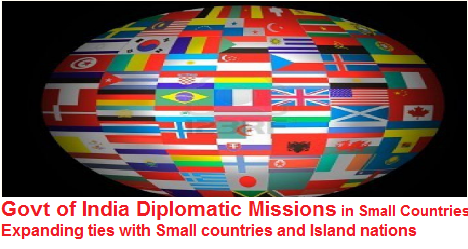 The countries where India does not have resident Mission are: Albania, Andorra, Antigua and Barbuda, Bahamas, Barbados, Belize, Benin, Bolivia, Bosnia and Herzegovina, Burkina Faso, Burundi, Cabo Verde, Cameroon, Central African Republic, Chad, Comoros, Costa Rica, Djibouti, Dominica, Dominican Republic, Ecuador, El Salvador, Equatorial Guinea, Eritrea, Estonia, Gabon, Gambia (Islamic Republic of the), Georgia, Grenada, Guinea, Guinea Bissau, Haiti, Honduras, Kiribati, Latvia, Lesotho, Liberia, Liechtenstein, Lithuania, Luxembourg, Marshall Islands, Mauritania, Micronesia (Federated State of), Monaco, Montenegro, Nauru, Nicaragua, Palau, Paraguay, Republic of Moldova, Republic of Congo, Rwanda, Saint Kitts and Nevis, Saint Lucia, Saint Vincent and the Grenadines, Samoa, San Marino, Sao Tome and Principe, Sierra Leone, Solomon Islands, Somalia, Swaziland, The former Yugoslav Republic of Macedonia, The Holy See, Timor-Leste, Togo, Tonga, Tuvalu, Uruguay and Vanuatu. All these countries are covered by concurrent accreditation. Since 2007, 23 countries have opened new Embassies in India. These are Equatorial Guinea, Honduras, Latvia, Lithuania, Guatemala, Bolivia, Estonia, Republic of Congo, South Sudan, Niger, Togo, Costa Rica, Burundi, Macedonia, Benin, Guinea, Malawi, Malta, Iceland, Botswana, Papua & New Guinea, Bahrain and Georgia. Of these, India does not have resident Mission in Equatorial Guinea, Honduras, Latvia, Lithuania, Bolivia, Estonia, Republic of Congo, Togo, Costa Rica, Burundi, Benin, Macedonia and Georgia. Proposal to open new resident diplomatic Missions on reciprocal basis in countries which have resident diplomatic Missions in India is currently under contemplation. This information was given by Gen. (Dr.) V.K. Singh (Retd), the Minister of State for External Affairs, in a written reply to a question in Lok Sabha today.